Home/Solar Cells/How To Check If A Photovoltaic Cell Is In Good Working Condition? A couple of weeks ago, I did a blog post on how to find cheap residential solar panels. From the blog post, the best place to source for inexpensive solar cells is at Ebay. The solar cells auctioned at Ebay are cheap because some of them are second hand goods. Some cells may even be damaged or cracked. How would you know if the cells are in working condition? Simple, you have to test it with a multi-meter. 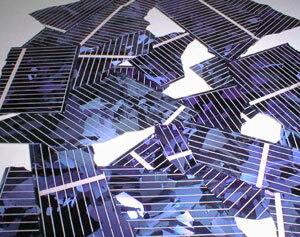 If you were to buy a box of PV cells from Ebay, your next step is to check each and every cell for cracks or chipping. Do a visual inspection on the cell. If there’s a big crack, chances are, it may not be working. When you have done with the visual inspection, your next step is to measure the current produced by the cell. To do this, you must know how to use a multi-meter. Set the testing rods in place and then turn the dial to measure current readings. The front side of the solar cell, the bluish surface is the “negative” side. This is the side when exposed to sun light, the elections will exit through the electrodes. The electrodes are the metal ribbon strips. If the electrodes are gone, you may have to solder a new one on it. On the back side of the cell, there are usually 3 contact points. This is the “positive” side. Now, go outside and put the solar cell under the sun. We want to measure its power production capability when exposed to sun light. Touch the testing rods of the multi-meter on the electrodes and the contact point. Make sure the nodes are correct. If you get this mixed up, you will get an incorrect reading. If the PV cell is producing about 2.5 amps or more current under the sun, it is in good working condition. If you are getting a reading of less than 1 amp, the cell is not generating power efficiently and can be discarded. Test all the cells that you bought from Ebay. If you are lucky, you won’t be getting too many damaged solar cell. Is it possible to build your own solar panel for less than $100? Yes it is if you are willing to do some leg work to source for cheap solar parts and components. To learn the tips and tricks on where to find cheap parts, be sure to check out the Green DIY Energy guide. For a comprehensive Green DIY Energy review, go to www.greendiyenergyreviews.com. 1) Reviewing Earth 4 Energy – Is Michael Hervey’s DIY home solar power guide the real deal?